High Quality lamp and quartz sleeve maintains output of 254nm. Available in 40 watt Philips T5 lamp and 75 watt T5 HO Philips UV lamps. 40 watt slim body unit is for drinking water sterilization by special order only. Designated SS-L40WT. 40 watt wide body unit is for pond use and is designated SS-L40WU. The 75wHO, 150wHO and 300wHO are all for use on freshwater aquariums and ponds only. 75 watt HO unit is a single lamp, 150 watt HO unit uses 2 lamps, 300 watt HO unit uses 4 lamps. 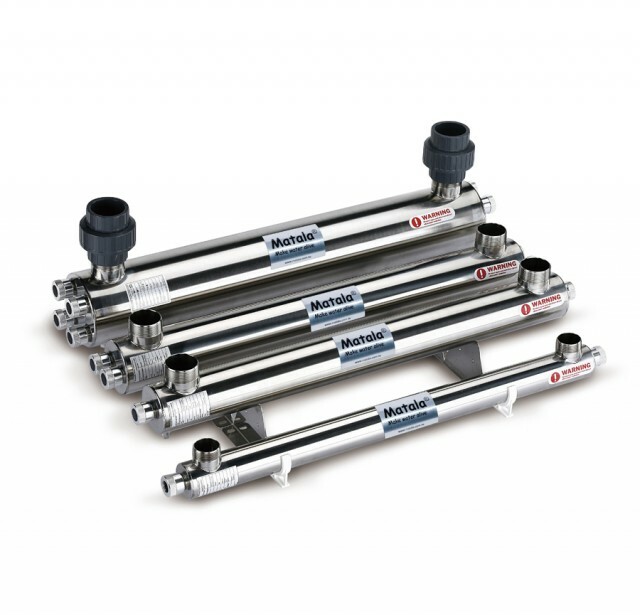 High flow rates possible due to high output lamps, and a single big bore body diameter. Does not restrict water flow of your pump. Long service life and requires very little maintenance. Polished stainless steel reactor chamber gives 30% increased UV reflection. 2" inlet / outlet male threads on all pond units. These flow rates are suggested for clarification of green water blooms only. Slower flow rates will increase the kill rate of water borne bacteria. Try to max out the recommended flow rate of the unit to get the best results for clarification.